You ever have one of those days where you’re just winning all the way around? For me it started by having this sunny spring like day off after having worked the entire St. Patrick’s day weekend. I had plans to go see a movie in the early afternoon when I checked online for showtimes and saw there was a matinee show that I had just enough time to get to. The thing I like about matinee showings is not just the cheaper price, $6.00 (!!!) which is enough motivation for me to get to a theater in the morning, but also the fact that the theater is typically empty at that time. I can spread out and don’t have to deal with the madness that comes with crowds at the theater. So after seeing Tyler Perry’s “Good Deeds”, which was a good film by the way, I engaged in one of my favorite sports……shopping. I make it a point of checking out the clearance racks in every store, ’cause face it, everyone likes a bargain, and there are some clothes that I feel are just not worth what the retailers charge. Regardless of who the designers are. If the people making the clothes at the factory can’t afford to buy them, as is probably the case in many instances, then to me it’s overpriced. But that’s just me, you might feel totally justified paying $100 for those jeans that more than likely cost about $10 to manufacture. So I eventually end up at Lane Bryant browsing through their clearance racks & among several finds I spot a pair of jeans that I wasn’t sure was going to fit. They were a size smaller than what I usually wear and I didn’t see any indication of a discounted price. But I decided to take a chance and give it a try-on anyway. 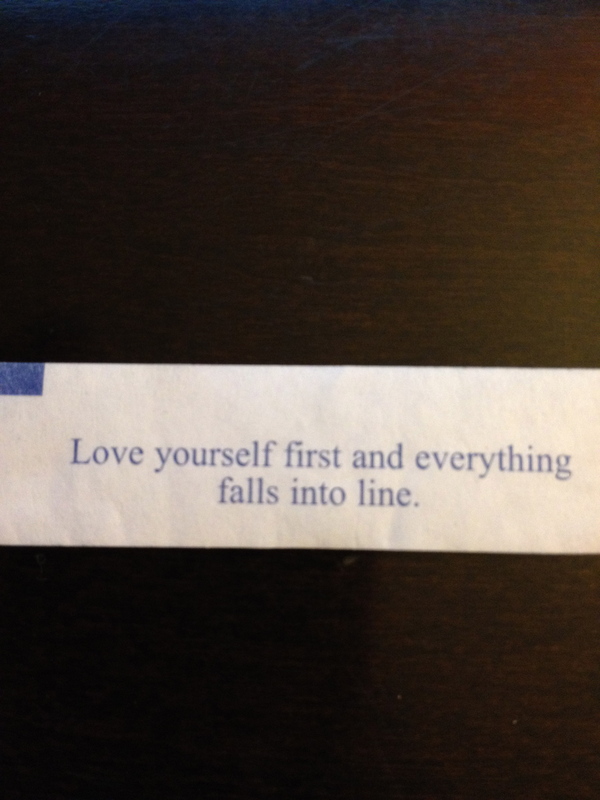 I find an open fitting room and on the floor is a reading from a fortune cookie that perhaps was a sign……. The only issue left was what the actual cost would be. I didn’t see any sign of a discount and the tag read $69.99. That’s not the kind of money I’m used to paying for jeans, but they fit so well I was willing to lay out the cash. I got on line with a prayer for any kind of discount. I get to the register and ask for a price check before purchase. I was so excited when the salesperson tells me those jeans were reduced to $20.00 (!!!!) Perfect fitting jeans at one size smaller AND at a discount? I did a two step jig just like Tyler Perry did at the end of this trailer for Good Deeds, LMAO! !